I wandered into my work area where I worked as a System Admin and fired up Wi-Fi on my phone. To my surprise, a mystery SSID I knew nothing about appeared in the list of available Wi-Fi networks. The signal on this network was so strong that it had to be in the building. What was this network and where was it coming from? I did some investigating and scanned each of our routers. What I discovered was that somebody had somehow attached a Linksys wireless router to a network outside our work network. This allowed employees to browse websites unfiltered and exposed. I had no idea where the cable ran to this rogue wireless router. I had to find it and shut it down though. How do you find the physical location of a hidden wireless router though? Grab a Windows or Mac laptop and charge the battery. Download and install InSSIDer on the laptop. The software costs $19.99, but you can get a free 7 day trial license. Launch inSSIDer on the laptop and walk to a place in range of the rogue network. 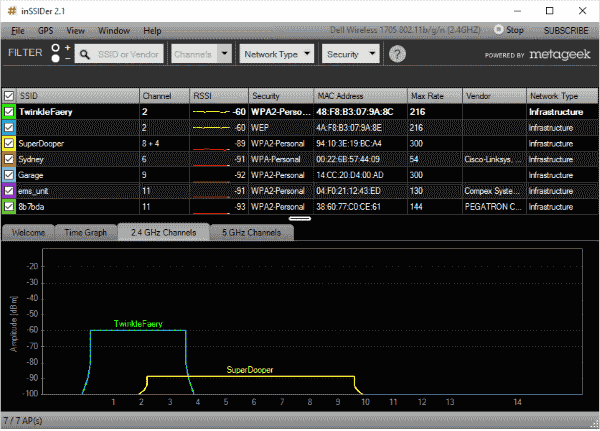 Have a look under the “2.4 GHz Channels” and “5GHz Channels” tabs to see if the network you are hunting is listed. The Amplitude should grow as you get closer to the router. When you reach a point where the network Amplitude is near the top, start looking for any power outlets or network ports. Trace cables from the power or networking ports to see if you can find a router connected to them. InSSIDer will show you how close your computer is to a wireless access point. I used these steps and was able to hunt down a cleverly hidden router. Hopefully, these steps help you too. Hello! Will this work for 3G/4G wireless routers too? The problem of WiFi analyzer on AppStore is that you have to be connected to that networ (and I am not). I use my mobile for this sort of stuff instead of a big laptop. The app I use is called “Wifi Analyzer” and shows you signal strenght so you can track down where the signal i coming from irl, and its free in the play store. Thank you! I’m having the same problem even in my own house. I’m going to give this a shot. Any other helpful software? InSSIDer stopped their trial license.